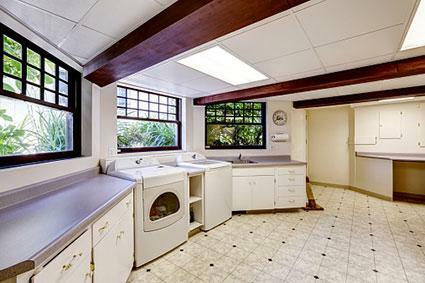 The lighting for laundry rooms is often overlooked, but adequate lighting can make working in this room easier. Approach the lighting of this room as you would any other room. Layer the types of lighting from ambient to direct lighting. There are many choices for this type of lighting. You can use either direct wire styles or plug-in designs to give a better broadcast of light. An overhead light is the typical lighting choice for the majority of builder lighting budgets. If you wish for better task lighting, you may want to splurge on under the cabinet lighting. Direct wiring would require an electrician or if you're knowledgeable/skilled, you might be able to accomplish this on your own; however, plug-in styles usually come with the necessary hardware for easy attachment underneath the cabinets. Just be sure the plug-in cord is within reach of an outlet. LED direct wire fixtures styles that are 8", 12", 24", 36", 48" in length. This style is a very common and popular choice. An aluminum housing for dimmable swivel head lights allows you to adjust in the directions you need. Surface or recessed mounted disk lights can be placed underneath the cabinet at measure intervals to provide excellent task lighting. Dimmable LED bar under counter light fixture is available either as a direct wire or plug-in option. This is another popular choice found in most laundry rooms. You can go with any type of ceiling light that's in keeping with your decor. One of the best utilitarian styles is a flush mount or a large panel style. This is a common size light fixture often found in laundry rooms. If your room is smaller than a six foot square, this light may prove too large for the space and a short length needed. You will need an electrician or adequate skills to install as with any direct wiring light fixture. A flush mount ceiling light with four T8 lamps will shed a powerful amount of light on laundry tasks. Go with a decorative two-linear fixture that uses T8 fluorescent tube bulbs. Make an architectural statement with a 4-ft linear fluorescent light fixture that is suspended from the ceiling with aircraft cables. A great look for any home decor, especially one with dark wood trim is a Minka Lavery walnut frame flush mount fixture. This light fixture features two 4 ft T8 fluorescent tube lights. If your style is industrial, there are lots of great lighting options for a laundry room to carry out your design theme. As with all lighting fixtures, if you don't have the necessary skills, hire a professional electrician to install light fixtures requiring direct wiring. Some industrial styles are more expensive than popular common fixtures. A brushed nickel finish on a two-light round flush mount fixture is an ideal industrial look for a loft laundry room or any industrial style decor. A rubbed bronze neo-industrial pendant light featuring an attractive wire guard is an upscale look for any chic laundry room. A pendant light or several pendant lights can be used over an open counter/bar to provide task lighting that's also highly stylish. A wall sconce is another lighting choice that can provide direct lighting for a work station, corner or entrance area. A high bronze or a galvanized finish for this "urban barn" style lighting fixture will carry the industrial look into the laundry room. A really cute industrial pendant light with a black umbrella shade can brighten up any laundry room especially for a modern, urban or industrial decor. For a great overhead lighting choice, a semi-flush mount with brushed nickel finish provides ample ambient lighting with a retro industrial look. If you have a high ceiling, large laundry room, you may have the ideal space to place two or three hanging light fixtures with a caged design. Often used for outdoor lighting, there's nothing to stop you from using the Craftmade Lighting Hadley Aged Galvanized Hanging Light fixture in a laundry room. This stunning design will give any laundry room an authentic industrial look. Drop ceiling panel systems offer ideal opportunities for appropriate panel lighting that is a natural part of the ceiling panel style. This type of lighting fixture will require a skilled person to install. Hire an electrician if you have no experience working with electricity. An improperly installed fixture is a fire hazard. 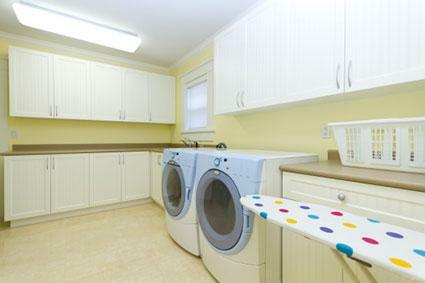 Depending on the size of your laundry room you may be able to use more than one light panel. A 2' x 4' LED or fluorescent light panel makes for an easy installation. Some come with dimmer capabilities for greater versatility in ambient lighting. If you have existing traditional light panels, you may decide to give them a fresh look with plastic styrene lighting panel designs. These lightweight panels can bring more sparkle into your laundry chores. Choose from several designs, such as eggcrate, cracked ice, prismatic or even a wavation design. Doing laundry doesn't have to be boring. 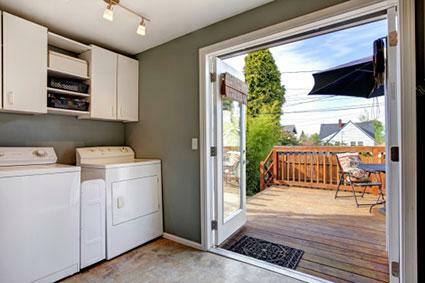 Many laundry rooms are located in windowless rooms. Bring a little fun into this space with decorative light panels/covers. Go with an astronomy design depicting a nebula, beachscape, clouds, trees, waterfalls, and other naturescapes overhead. One of an all-time favorite for modern style lighting choice is track lighting. This lighting style has come a long way since the 1960s versions. As with all direct wiring, hire a professional electrician to install. Many track light fixtures have adjustable spotlights that make it a very versatile choice. Not all track lighting follows a ceiling track. Some designs feature an overhead light connection with a suspended track lighting. Go with this rubbed oil bronze lighting fixture that supports six directional spotlights. The spotlights can be turned to shine light in the direction you need it. Kichler's Hatter's Bay Collection features a polished nickel finished light fixture that features a suspended track of three individual halogen lamps. The lamps can be swiveled 90° and rotated up to 350° to provide great directional task lighting. This 10 ft S-shaped track five light track lighting may be just what you need to provide various directional task lighting. Recessed lighting is a wonderful way to add direct lighting for tasks. These are available in various sizes and mounting styles. You can place this type of lighting on a dimmer for greater control of the lighting. This style can be installed under the cabinets, the ceiling directly over work stations/table, washer and dryer and in the middle of the laundry room. Hire a professional electrician to install these direct wiring light fixtures. If you install lights that are non-adjustable, the light cannot be redirected and will shine directly from the ceiling. You may prefer to opt for recessed lights that can be adjusted to provide direct or even task lighting. Not all recessed lighting is equal. You aren't limited to utilitarian pot lights in the laundry room. 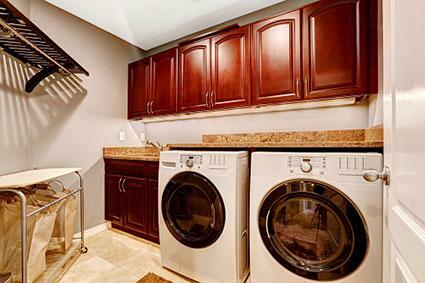 If your decor is ornate and elegant, don't neglect the laundry room decor. Opting for a Florence Patina trim will make your laundry room feel like the rest of your home style. Another design choice for recessed lighting is a Hurricane 10.25-Inch Recessed Light Shade that features prisms and a chrome finish. Another recessed style is one that features an adjustable angle light trim to provide directional lighting. 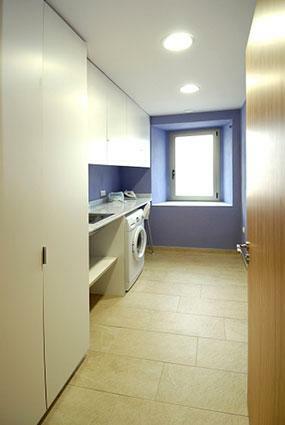 A laundry room should have several types of lighting to accomplish the necessary tasks performed in this room. 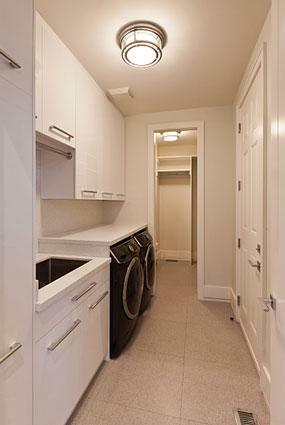 Ambient, directional and task lighting are necessary for an efficient laundry room design.